Often, we are at that point in life where we see success right on our face. It is that time when we can see success coming right to us. It is a feeling of both accomplishment and disquiet because it is just half an inch away from us. Right when we just cannot wait to grab it and this time again success failed us. The intensity of disappointment ranges from the importance of success and frequency of related failures. 1. Failure is a mirror showing moment: No matter whether the moment of failure came to you because of your own short-comings. A failure brings a wide mirror of reality right on to your face. 2. Failure makes you a take a re-look at your strategy: Innovation is the product of fear of failure or becoming redundant. If you dig deep into why you failed, you can find direction and get one notch higher towards success. 3. Failure brings the best in you as an individual: A failed person will have more respect towards the struggles of people around. A different perspective and a fresh outlook towards the world out there. Success is a constant struggle we fight in solitude. I do not think that anyone is an accidentally successful person, it needs work to be successful. It takes efforts either of the person who succeeded or of those who work for that person. Success is very brittle and relative. Author's Note: No one succeeds at the very first shot. Success arrives after a series of failure and it is short lived. The same strategy will not work again. P.S: If you have something to add, I would be delighted to read. True words. 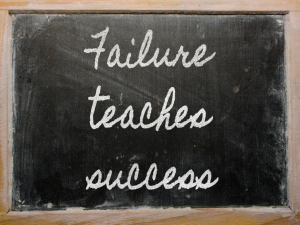 As the old saying goes, "Failures are just stepping stones to success". At the same time no matter how beautifully such stuff is written, we often get demotivated with failure. True that! Optimistic take on failures! Thank you for dropping by. I am glad that you connected to the post so well. Thanks for sharing it. I loved reading it. This is a reminder that I have more opportunities to fail. I often lose heart when I think about a repeated failure I face. .... and more heartbreaks to bear and some friends to let go. True. After achieving success, failures are grandiose part of the story. Without failure, how can you ever respect and enjoy success. "Success is a constant struggle we fight in solitude" - Wonderfully summed up by this line. Indeed, 'success' is a highly subjective perception, and it has to carve out its path through the tricky, treacherous emotion after every failure. Interestingly, the 'failure' as a perception, quite unlike the human emotion (well.. most of the times), is surprisingly magnanimous, as it teaches, enriches and evolves us to be somewhat better. Thanks Bodhi for such an encouraging comment.